These are my new favorite! 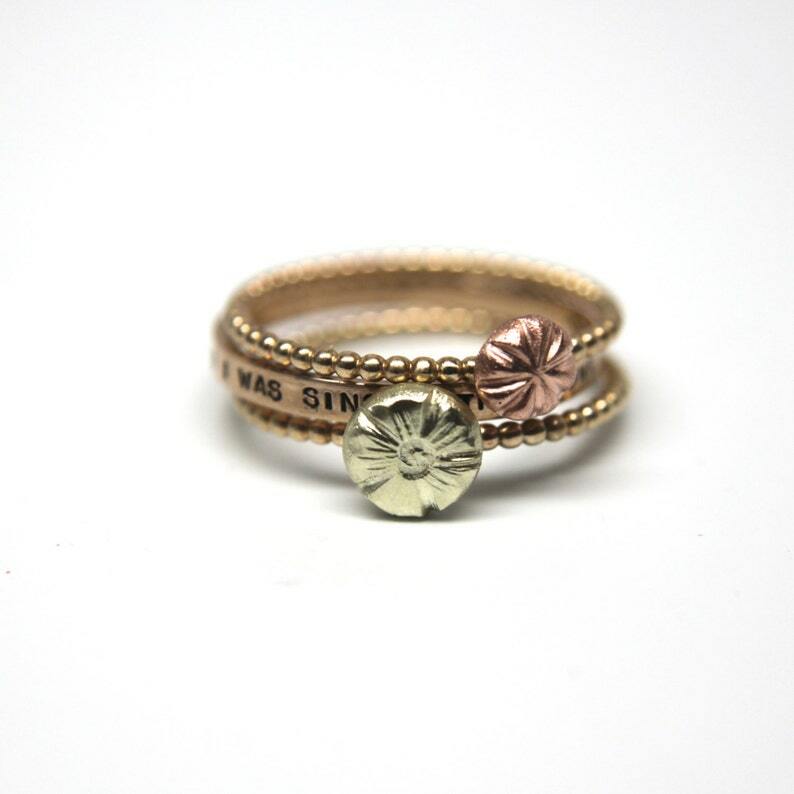 They're a sweet, playful, and feminine stacking ring that look so dainty worn alone, or in a cluster. This listing is for three rings- one large open cherry blossom, one smaller cherry blossom bud, and a custom stamped 14k gold ring. Each blossom is individually created with extra scraps of 14k gold I have saved up, so each one is slightly different. I can create them in 14k white gold, yellow gold, pink (rose) gold, or green gold cherry blossom buds on a simple 14k yellow gold beaded band. Metal mash up means I take whatever gold scrap I have and melt it together- this can produce some lovely gold hues! If you prefer to mix up your gold selection, please leave your selections in notes to seller. You can also choose to have them oxidized for an antiqued look (shown in lower left of picture 4). As with all sets sold in my shop, this set is sold with a built in discount! ***Please see my shop policies for information on my exchange policy and turnaround times.